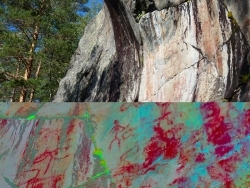 As direct dating of the paintings at the Abri Faravel is impossible, we are obliged to consider European and regional analogues for the motifs, and then assess how the chronology of the different phases of activity identified at the rock shelter and across the plateau might correspond with the production of the paintings. The following section presents an overview of comparable rock art images, and then develops a contextual interpretation of the motifs. We consider engraved images as well as paintings, as rock paintings are uncommon in the western zone of the Alps, and extremely rare in the rest of the Alpine arc. 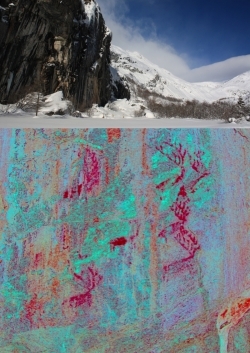 Paintings do exist in the Piedmont area (western Italian Alps and the frontier with the eastern French Alps), in particular in the Pinerolo region, on sites such as Rocca di Cavour (420m) (Gambari et al. 1999), in the Pellis valley (Balma di Mondon, 850m) (Gambari et al. 2001), in the Germanasca valley (La Roccia della Fata, Ponte Raut, 685m) (Arcà 1995), in the Alpe Veglia area (Balm d'la Vardaiola, 1950m) (Crosa Lenz 2001; Gambari 1994; Gambari 2007; Poletti Ecclesia 2011) and in the Val Antigorio (Balma dei Cervi) (De Giuli and Priuli 2012). These sites are part of a group that also include French examples, such as Les Oullas-Cornascle I (Ubaye, Alpes-de-Haute-Provence, 2390m) (Defrasne and Bailly 2014; Mocci and Walsh 2007); Bessans-le-Château (or, Rocher du Château, Savoye, 1770m) (Thirault 2008), the Peney cliff at Saint-Jean-d'Arvey (Savoye, 1150m) (Ayroles and Porte 1972), the Gias delle Pitture (Mont Bego area, 2050m) (Bernardini 1977; Mano 1995). It is generally accepted that these sites are dated to the Middle through to the Late Neolithic. Some of these sites do include depictions of animals similar to those found at Faravel, and these are discussed in more detail below. Paintings that are more recent, although lacking precise dates, exist in the central Alps and in Piedmont. These include an anthropomorphic figure at the Monte Bracco, a hunting scene at Casa del Gallo in Pellis valley, archers on horseback at Casa Fago and Costa Seppa 1 in Val di Susa, a circular figure with spokes at Campanine in Val Camonica. 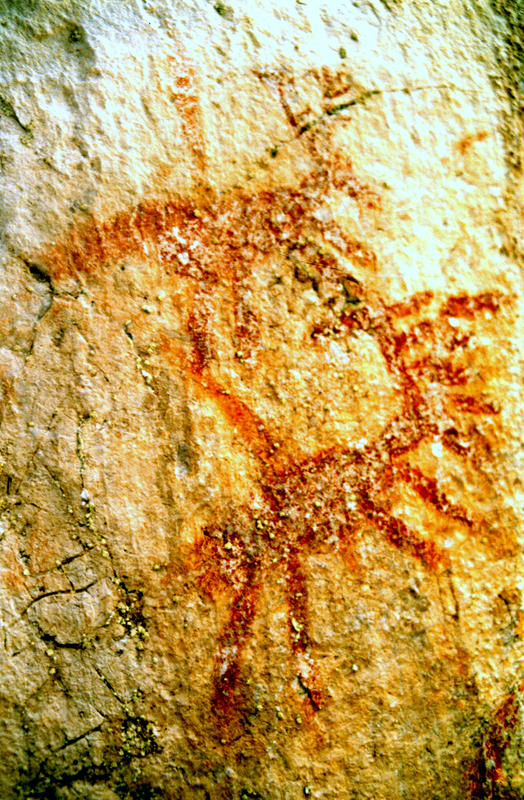 Others paintings are attributed to the Iron Age from their 'style' (a hunting scene at Figna and horse riders at Scale di Paspardo in Val Camonica) (Arcà and Fossati 2012; Colella nd). 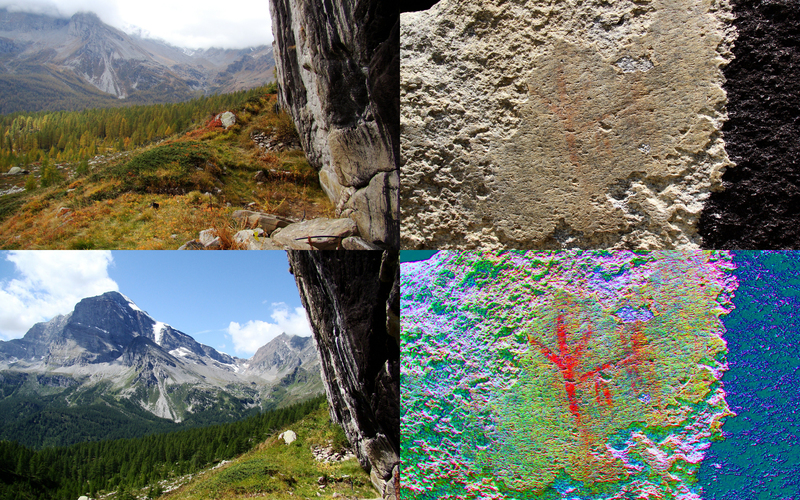 Whereas paintings in the Alps are rare, engravings forming the principal Alpine known rock art forms, in particular across the Mont Bego, Maurienne and Val Camonica areas, they are dominant across parts of Provence just to the south of our study area (Hameau 1989). Some of the most significant areas of rock art are the engravings in the Haute-Maurienne and the Vallée des Merveilles, some 50km and 100km to the south-east of the Ecrins. However, these areas do not provide any motifs comparable to those at Faravel. The images here are dominated by weapons, and domesticated animals as elements in ploughing scenes (de Lumley 1995). 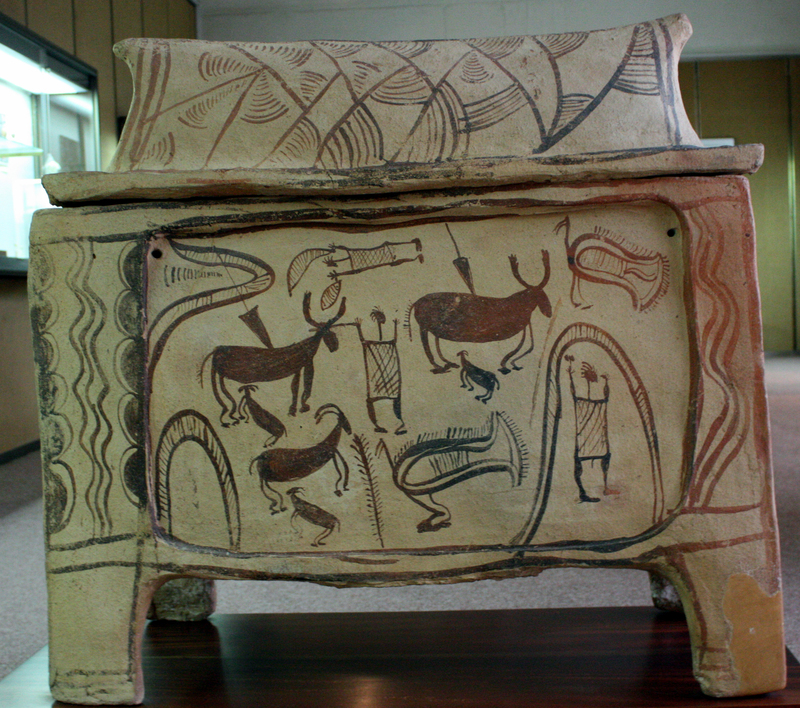 This iconography articulates clear links with agricultural landscapes, including representations of what has been interpreted as fields (viewed from above) (Arcà 1999; Arcà 2004b). 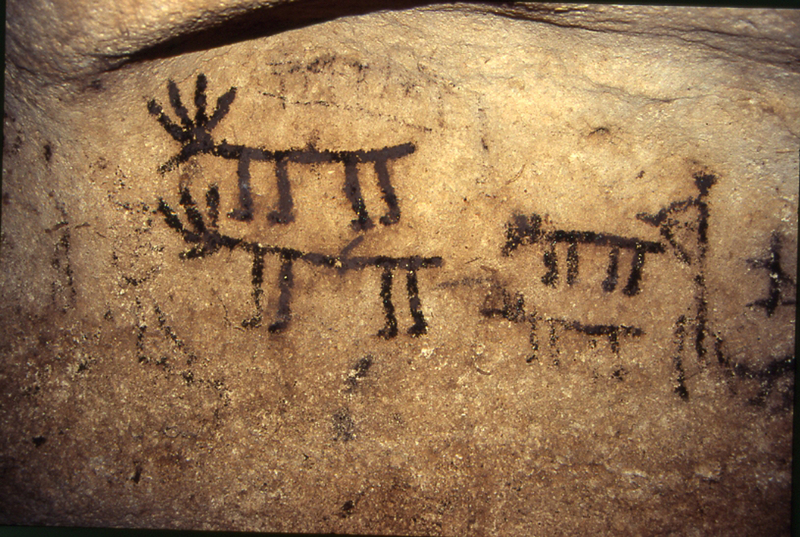 Across the western Alps, the most common mammal represented in rock art is deer. They appear on rock surfaces from many chrono-cultural contexts. Both from a stylistic and thematic point of view, the closest parallel may be the Balm d'la Vardaiola (see also http://www.sitinet.org/287.as), a site (130km to the north-east of Faravel in the Piedmont region of Italy) where a schematic painting is attributed to the Neolithic (Figure 15). This date should be treated with some caution, as this period is absent from the excavation stratigraphy (Gambari 1994; 2007; Crosa Lenz 2001; Poletti Ecclesia 2011). However, the image does remind us of the deer with radiating antlers at Faravel. In the French Alps, the Rocher du Château site at Bessans (at c.1770m, 85km to the north-east of Faravel) (Figure 16) comprises a rock surface with a group of at least ten painted red deer (Nelh 1976). The animal figures are stylistically different from those at Faravel, and there is no visible suggestion of hunting. Excavations at the Rocher du Château revealed that this site, like the Abri Faravel, saw several phases of occupation during the Neolithic, with ochre discovered in levels dated to the second half of the fifth millennium BC; a Vasi a Bocca Quadrata chrono-cultural occupation phase (Thirault 2008). Finally, there is the hunting scene at Figna in Val Camonica (Italy), described by Arcà and Fossati (2012) and Collela (nd), and attributed to the Iron Age. The paintings here are not schematic, although the authors identify an anthropomorphic figure, along with a spear and a deer. 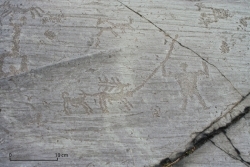 A number of engraved panels comprise what have been interpreted as 'hunting scenes' with deer and dogs (Fossati 1991). Within the Alps, a reasonable analogue comes again from Val Camonica (Lombardy, Italy). The motifs most similar to ours, found at Naquane, Roccia Grande, are indirectly dated to the Iron Age (Arcà and Fossati 1995, 119). 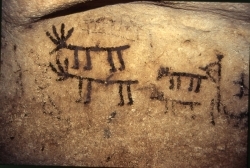 One scene is interpreted as comprising a male deer with a spear in its chest, and a dog following, or biting the rear of the deer (see Rupestre.net) (Figure 17). At Lanslevillard (Aussois, French Alps), an engraved 'hunting scene' depicts what are clearly ibex being hunted by a person holding a spear, accompanied by a dog. There is also an interesting image of what seems to be a shepherd killing a wolf that is attacking a sheep – these representations have been dated to the Iron Age, and are quite similar to images from Val Camonica (Arcà 2004a). We should also note that Iron Age spears are quite common finds across parts of the Inner Alpine zone (Pauli 1984, 125). In the Val Camonica area, the dominant theme in the Iron Age imagery is that of warriors engaged in duels, riding and hunting. Among engravings attributed to this period, there are many deer shown in hunting contexts, some chased by dogs, others facing dogs (Fossati 1991). Alpine paintings are considered as a north-eastern expansion of the Neolithic iconographical phenomenon from the South of France; however, animals are relatively rare in the painted rock shelters from this region. Those that are represented include deer, ibex, and snakes – deer being the most common animal (Hameau 2006). Immediately to the south of the Ecrins, in Lower Provence, we find images of wounded animals painted on rock surfaces. Sites in this region provide some of the most convincing comparisons for the Faravel paintings. Located 100km due south of Faravel (at c.800m), the paintings from Pierre Escrite (Chasteuil, Alpes-de-Haute-Provence) (Garidel and Hameau 1997), show deer on the north-east panel that are similar to that at Faravel. These images have been interpreted as wounded deer with projectiles in their backs (Figure 18). We are confident that one element of the Faravel animal figure is a projectile in the back of the deer. Finally, as we have noted elsewhere, the animal figures at Faravel are associated with a set of parallel lines. 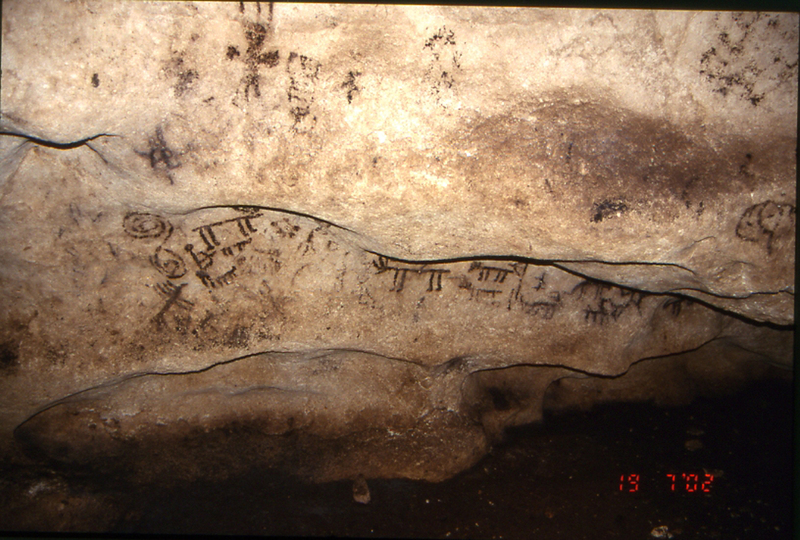 A comparison for this type of image comes from the Grotte de Chuchy (Tourves, Var), where one panel comprises five vertical lines, with two horizontal lines (c.8-10cm in length) that cross these. Such a motif might be considered an analogue for the lines at Abri Faravel (Hameau 1989, 45-6), which are somewhat longer; certain lines might in fact be schematised anthropomorphs (Hameau 1989, 90). There are also vertical lines at the Abri des Eissartènes (le Val, Var). These were all produced using a reddish paint. However, paintings on the ceilings of these sites in lower Provence are rare; the Grotte Chelo is one exception. The chronology of these paintings is uncertain since there is no chrono-stratigraphic argument to support it. Hameau suggests that they date back to the fourth and third millennium BC based on the material discovered in the rock shelters (Hameau 2004, 465; Hameau et al. 2011). Another parallel could be Bessans, where the deer are associated with 'abstract' images. Among them there are sets of vertical parallel lines, some crossed by a horizontal line (Nelh 1976). The interpretation of these is difficult. They might merely constitute a mechanism for marking territory, or, within the context of the 'hunting scene', these lines could represent the edge of forest. Summarising this French and northern Italian evidence, we feel that the Neolithic images of Pierre Escrite (Chasteuil), the possible Neolithic paintings at the Balm d'la Vardaiola and the Iron Age images from Val Camonica constitute some of the most convincing parallels for the images at Faravel. Other than the similar alpine imagery described above, the most striking analogue for the paintings from Faravel, as regards to both themes, and 'style', are the images from the Deer Cave (Grotta dei Cervi - located on the Salento coast in Porto Badisco (Otranto, Lecce, Puglia, Italy)). 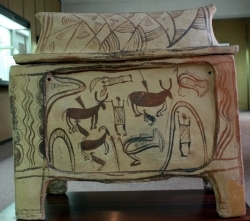 These images are attributed to the Neolithic. 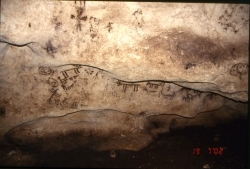 In this cave, deer within hunting scenes are represented either with comb-shaped antlers, or with three, four, or five radiating antlers (corridor 1, zone 2, group 8) (Graziosi 1980). Here, the deer are associated with human figures carrying bows. Some of the deer have an oblique line entering their back; probably a projectile (Figure 19a and b). Smaller animals are present, close to the human figures; these could well be dogs partnering the hunters. More specifically, the composition of the antlers is very similar to that at Faravel. Moreover, there is a possibility that the animal forms and the numerous comb-shaped figures are representations of the same phenomenon. In a number of ways, the composition, style and hunting connotation at the Grotta dei Cervi echoes the Faravel imagery. Although in an entirely different topographical situation to the Abri Faravel, the coastal cave of Grotta de Cervi (along with other cave sites) were also '…located on the margins of the agricultural landscape' (Skeates 2005, 91). Although this cave site would have been easily accessible from the surrounding contemporary settlements (Skeates 2005, 110), the paintings were less accessible, as many are some 200m into the cave complex (Graziosi 1980, 33). Even though much alpine rock art (especially engraved art) includes anthropomorphs, depictions of metalwork, ploughing scenes, along with possible representations of fields and buildings (Frachetti and Chippindale 2002; Arcà 1999), the Faravel rock art is firmly situated within a wider European tradition that employs hunted deer motifs. As described above, the figurative formula for this 'hunting scene' (comprising, people, cervidae, and sometimes dogs) is distributed across time and space, and upon different media. At one end of Europe, in Finland, the site of Astuvansalmi (Figure 20) comprises numerous motifs (including deer or elk) on a cliff wall above a lake (Kivikäs 2001), while a motif extraordinarily similar to the Abri Faravel art is found on a Late Minoan larnax (coffin) from Chania, Crete (Figure 21). The consistent form of these codified representations, and their recurrence across time and space, could suggest that they are not 'hunting scenes', describing a precise action in a definite time and place (Lenssen-Erz 1992), but perhaps ideograms, a unit of meaning, such as the ploughing images engraved on central alpine steles (Fedele 2013). As we have already noted, the painted images at the Abri Faravel comprise three components: (1) two quadrupeds facing one another, (2) two groups of roughly parallel lines, and (3) six 'geometric' colour marks. We could add a fourth component if we accept that the anchor-shaped figure is an anthropomorph. Based on the evidence from other sites within the region and further afield, we feel justified in claiming that our animal composition comprises a deer facing another mammal (possibly a dog). We also suggest that the long straight object entering the deer's back is a spear or arrow. More specifically, the motifs from Pierre Escrite, the Balm d'la Vardaiola and the Grotta dei Cervi are the most similar among the group of examples presented in the preceding section. These all articulate a similar theme – that of hunting deer, possibly using a dog. These images were in some ways part of a tradition, a persistent set of symbols, or collective representations Moreover, it is not uncommon for painted animal species to be associated with figures that are more 'abstract'. Consequently, we suggest that the images at Faravel, at least those on the ceiling, could have been synchronous and thus formed one, unified composition.